A long time ago in 2009 I had finished many rounds of P90X and my first round of Insanity. To say I was feeling a bit beaten up from those extreme workouts would be an understatement. So when I heard Tony Horton made the 10 Minute Trainer I figured I would give it a try. The thing about 2009 was I was 29 years old. In 2018 I am now 37. A lot has changed since then in regards to my fitness. One thing I did not have a problem with back then was recovering from a workout. I had the ability to push through the soreness and finish workouts. Energy was everywhere. Not so much now with me being a Dad to two kids. What does all of this have to do with the 10 Minute Trainer? What you should know is I started writing a review for the 10 Minute Trainer in 2009 and stopped only to find it in my admin area nine years later. 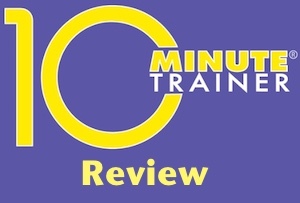 After a couple of minutes of looking at what I had originally written I decided to re-write what I had written and give you an updated review of the 10 Minute Trainer. The main reason why I did not finish my review was because I did not finish the program. I found 10 Minute Trainer to be boring and a bit cumbersome. I had just finished P90X and Insanity. Neither of which are boring. All of the 10 Minute Trainer workouts I tried had one thing in common which I did not like. They were all 10 minutes. Maybe 10 Minutes of working out isn’t perfect Tony. I was already in very good shape from doing the extreme workouts that when the 10 Minutes were over I was barely warmed up. I’m not knocking the workouts. They are very good warm up type workouts if you want to do something else. I just could not see myself progressing through 30 or 60 days of the 10 Minute Trainer. When I bought the 10 Minute Trainer DVDs in 2009 you had to wait for the advertisements from Beachbody to finish before the next workout would start. All of the workouts were on one DVD which was great but it wouldn’t just move onto the next workout. It would kick you back to the main menu forcing you to select another workout which completely ruins the pace. I remember being annoyed waiting for another workout to come on as one workout was not enough. A 10 minute workout typically took 15 minutes between loading up the dvd, selecting the workout, and waiting for the ads from Beachbody to play. Before I go into more of what I don’t like about the 10 Minute Trainer lets take a minute to know more about it. 10 Minute Trainer was developed by Tony Horton for people on the go. This includes anybody from a stay at home mom to CEO’s of major corporations. The issue is always the same. Nobody has time to workout. Everybody knows how important their health is but its easy to make up excuses or life just gets in the way. What makes the 10 Minute Trainer workout so successful is it eliminates the excuses. Anybody can find 10 minutes in their day to workout. Tony Horton introduces the concept of “Super Stacking” with 10 Minute Trainer. How it works is you mix in cardio with resistance training together at the same time. This shortens up the workout into an action packed 10 minutes. No time between sets to work on different muscle groups. All you need is a resistance band and 10 minutes to get the results you want from these workouts. You get a resistance band, customized workout calendar, Rapid Results Guidebook, and Tony Hortons 10 Minute Meal Plans with each 10 Minute Trainer package. A little known program are the Tony Horton One on One workouts. Basically its Tony’s camera guy and him at Tony’s house making up workouts. And some of these are tough. Tony does not let us down with his Lower, Upper, and the Chest & Back workout in the deluxe workouts. The format is different as its not in the studio but who cares, the workouts are good. You might actually want a break after these workouts. If you absolutely want to buy the 10 Minute Trainer in DVD form in 2018 then you’re still in luck. What I would recommend over buying the 10 Minute Trainer DVDs is a Beachbody On Demand membership. With the BOD membership you will be able to access the 10 Minute Trainer and every other Beachbody workout ever made whenever you want. Subscription prices start at $40 a quarter up to $99 a year. There is a 14 day free trial available to kick the tires. Its been nine years since I bought the 10 Minute Trainer and not once have I thought about doing them again. I’m pretty sure I gave the dvds to my parents in 2012 and they never touched them either. And even now with 10 Minute Trainer available on Beachbody On Demand I still haven’t done it. I would rather do something like the Primal Blueprint workouts (pushups, pull-ups, squats, planks) in 15 minutes instead of having to stack multiple 10 Minute Trainer workouts. Or even something like T25 or Power 90. You’ll get similar workouts in 25 to 45 minutes without having to stop and wait for the next workout to load up. There is just something about having to stop and start that I do not like. Saying all that you cannot deny that Tony Horton knows how to put together a workout. Maybe spend the time learning one or two of the workouts by memory and do them on your own time without having to load the dvd or Beachbody On Demand. Grab a resistance band and do a round or two while watching TV or at your desk while making sales calls like how I used to do. Who knows. Maybe when I’m a little older or if I get really out of shape I’ll give 10 Minute Trainer a try. Until then, I pass.